Sometimes the most helpful lessons are learned in unexpected and unplanned ways. 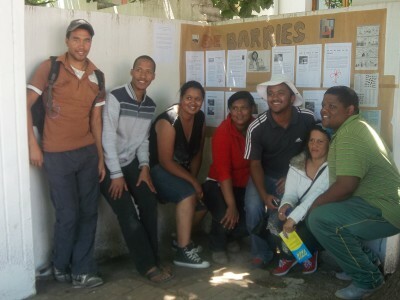 This article tells the story of how Net-vir-Pret, a small NGO working with children and youth in the Klein Karoo town of Barrydale, learned some unexpected lessons and how that knowledge changed them as people and changed their understanding of their mission. Net-vir-Pret works to uplift children from disadvantaged backgrounds. We endeavour to empower them by giving them the childhood they deserve; by allowing them to play and be creative and to learn that they are capable of achieving. 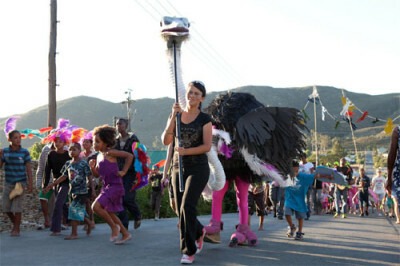 Towards this end we offer the children of the town and farms a range of sport, educational and cultural activities, and the highlight of each year is a giant puppet parade to mark the Day of Reconciliation. The parade ends in a public performance on the netball field of the school which stands on the hill separating the two sections of our divided village. In 2014 the Department of Social Development made it possible for us to take on seven interns to assist with our work. All seven were in their early twenties and had been involved with Net-vir-Pret over many years, first as children in the Aftercare Programme and later as members of the teenage Young Leaders Programme. Our Interns wanted to find a way to impact the social problems affecting the community. From the long list of problems, substance abuse was chosen because it was common knowledge that tik (methamphetamine) had become available in the village, and it was decided to research the drug, its effects, its availability and the attitudes of our young people to it and to make this information available to our community at large. The project ran for several months; questionnaires were composed for different age and interest groups, interviews were conducted, responses collated and the Interns finally produced a news sheet which presented their findings. However, as this process developed, a separate issue arose. A chance mention of “The First People” at a routine meeting of staff and Interns led to the discovery that most people present had never heard of the concept and few had any knowledge of the KhoiSan people and their place in our history. There was, moreover, a feeling that the term “Khoi” was demeaning in some way and to apply it to any person was insulting. It was agreed that we would set up a working group of both staff and Interns to research the KhoiSan which would meet on Thursday mornings and have an open membership, so that other interested parties could join. We would ask: Who were the KhoiSan? How far back could we trace them? How did they live? What were their beliefs? What were their values? What happened to them? Who and where are their descendants? 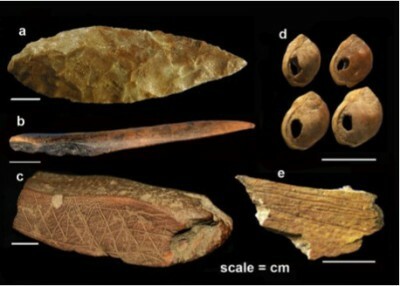 Artifacts from the Blombos Cave c 75,000 years ago. (photos d’Errico and Henshilwood). Once the group had found its feet, we began to uncover our buried history. We learned the astonishing fact that Middle Stone Age artefacts were found at Blombos Cave on the coast near Riversdale, not far from our village. This means that 70,000 to 100,000 years ago people here shaped and used stone tools, some 30,000 years before they did so in Europe. 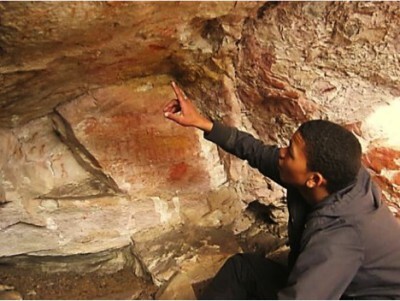 According to authorities, the paintings on the cave walls at Blombos are believed to be the oldest works of art in the world, as is a necklace found on site considered to be the oldest of its kind. As to the people who made these artifacts, they are believed to be the ancestors of the San. We visited the San rock paintings in the Tradouw Pass, ten minutes outside of the village, and learned that “Tradouw” meant “the women’s path” in the old Khoi language and that there had been many Khoi living on the slopes of the Langeberg in our region. Soon we learned to name them as belonging to the Attaqua, Hessequa, Chainouqua, Gouriqua, Inqua, Cochoqua. We researched the similarities and the differences between the Khoi and the San and investigated their social structures, their daily habits, their beliefs and preoccupations. Finally, we learned what had happened to them after the Dutch arrived at the Cape in 1652, how the San had been virtually exterminated, while the Khoi had been dispossessed of their land, cattle and sheep and had largely become enserfed to the settler farmers. As these two processes unfolded, an often uncomfortable debate arose about how the members of our group identified themselves. 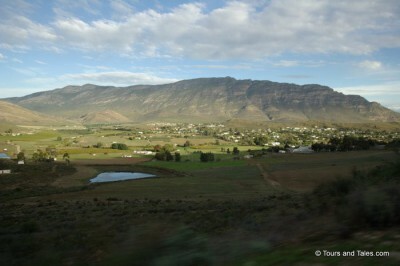 If the San and the Khoi were the original inhabitants of the Overberg, how did we relate to them? Were we their descendants? Responses varied between “my ancestors were European” to “I feel I am a Khoi and my children are Khoi”; but the most common response was to express ignorance of ancestry and to identify as “Coloured”. This in turn led to reflection on the term “Coloured”. Where had it originated? What did it mean? The literature informed us that the term had first been used to describe the Cape Slaves after emancipation in 1834. Closer to our own time, it had been employed by the architects of Apartheid to marginalise and stigmatise a large grouping in our population and to justify depriving them of full civic rights. We noted that the present administration has kept this classification, ostensibly in the interests of redress, and we are expected to claim this identity when we fill in official forms. We also recalled the notorious utterance by a top official in the Presidency some years back who had referred to the “problem of the oversupply of Coloureds in the Western Cape”. It seemed that in many peoples’ minds in our country, the first “Coloureds” had only appeared after the early Dutch settlers had co-habited with the native women, an issue which itself is obscured behind veils of shame and immorality. A common attitude was that “Coloureds” don’t know where they belong, being neither white nor black. A brainstorming session on what we thought were popular notions of “Coloured” character produced “unreliable, untrustworthy, deceitful, good-for-nothing, degenerate, drunk, uncultured”. In the end we largely agreed that, for ourselves, if we are asked to self-identify we would assert firstly that we are human beings, sharing the planet with billions of others. Secondly we would say that we are Africans, sharing the continent with all the other inhabitants. Thirdly we would assert that we are citizens of South Africa, deserving an equal place with our fellow citizens. The question of heritage would be a separate issue. Where do I come from? What is my heritage? Those questions could only be answered individually by each person undertaking a search into family history. We then began looking in a new light at the deep social problems in our community. How did the members of our township self-identify? Had they internalised the humiliating “coloured” characteristics described earlier? Did this explain in some way the continuing disorders from one generation to the next? Generally speaking, almost no-one knew anything about the rich culture of KhoiSan from whom so many of us are at least partly descended. If we ourselves had found a new sense of pride and dignity in exploring this part of our ancestry, could the same happen in our wider community? Our first decision on the way forward was to make “The First People” the theme for the 2014 Day of Reconciliation parade and the immediate task was to prepare the community for the event so that the maximum benefit could be derived by everyone. 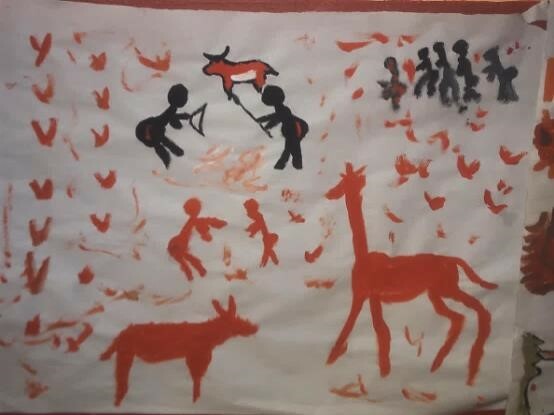 During the September Holiday School our 25 Young Leaders (young people still in high school) presented aspects of KhoiSan history to 70 participating children and then guided them in making their own versions of rock paintings. 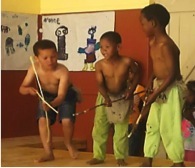 They also designed and constructed KhoiSan artifacts (bows and arrows, spears, straw huts, headdresses, the kaross) which were used as props for performances at the end of the week. By then everyone had a good idea of who the KhoiSan were and how they lived and also of the differences between them – the San were hunter-gatherers and the Khoi pastoralists and herders – although if the Khoi lost their herds through famine or disease they would revert to a San style of life. In the meantime the Interns had been busy constructing a board for public display which described aspects of KhoiSan life and culture which was put on show at the library and then at the local churches and schools in rotation. The Day of Reconciliation Parade is run in partnership with the renowned Handspring Trust for Puppetry Arts who construct the giant puppets for the event and guide us in creating smaller hand-held puppets which the children make themselves and carry. Booi, a young man from our village, is fed up with the world and goes out walking in the veld. He is caught in a storm and takes shelter in a cave where there are rock paintings and where he falls asleep. When he wakes, he finds the rock paintings have come to life and in panic he stumbles out of the cave to find himself in the world of the KhoiSan, many thousands of years ago. These people teach him their values of respect for all creation and for himself and in a rite of passage, the hunters guide him in tracking and eventually spearing an Eland, so beloved of the San. As the Eland dies, her spirit rises and in rising with it, he understands his deep ancestry from so far in the past and finds a new pride in himself and his people. The story ends with a general celebration. 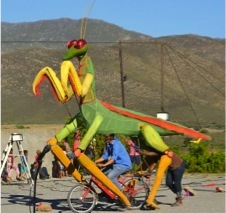 We agreed that the giant puppets should be the Eland and Kagg’agn, the Mantis who the San believed was the Creator of everything. December finally arrived and arrangements intensified as the Handspring team arrived and Young Leaders and Interns prepared for their week with about 150 children during which each would make her own hand-held puppet and learn the song and dance routines that were to be part of the performance. Net-vir-Pret’s band, the Jazz Monkeys devised musical accompaniment and work began on the final rehearsals. 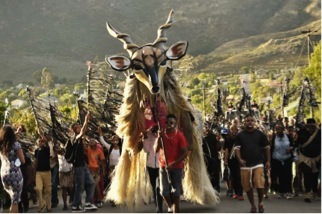 On the day of the performance, the Eland and Kagg’agn paraded through the two sections of our divided village, drawing people to the site of the performance. A huge crowd followed them and everyone agreed that Kagg’agn Dreams took this annual event to new heights (have a look at the video below). The exploration of ancestral heritage and cultural roots had a decided impact on community esteem and personal identity. The participants took part in an experience that they will remember for the rest of their lives. This year (2015) we are taking our work on Heritage and Identity to a new level by looking at the issue of the Cape Slaves. Who were they? Where did they come from? What was their role in the early history of our country? What was their experience? What happened to them after emancipation? Who are their descendants? The work is already far advanced. The Thursday group continues to meet with members undertaking research on aspects and reporting. As with the KhoiSan project, a rich body of fascinating information is being uncovered by staff, the new Interns and the Young Leaders and the immediate task is to find ways of including the children in the coming holiday schools. After that, we will devise a method of educating the wider public and in December, the Day of Reconciliation event will feature the Cape Slaves and we are confident that our community will derive from it a new appreciation of their heritage, as we indeed have ourselves. “I used to think I’m a Coloured and that’s that. I never thought of looking over the wall. Now I know that I have Khoi and Slave blood in my veins and I feel rich and proud”. For our organisation, we have found a more meaningful way of understanding our mission and of integrating our different activities into a unified thrust forward. Written by: Derek Joubert, ex-worker in the field of education who has retired to Barrydale where he is the Administrator of Net-vir-Pret. What an extraordinary and beautiful story to read – and what a special experience for all involved. I look forward to hearing the results of the continuing research. A wonderful story about real impact, carefully worded and so sincere. The Net vir Pret team – interns included – is amazing! This account of an inspirational and much more complex project than even this narrative suggests, is a tribute to all who have been involved in bringing it to fruition. Barrydale is a role model for what can be achieved, and what is waiting to be achieved in all of the little, neglected, half-forgotten towns in the Karoo. The story is, of course, not complete, but will continue to grow as long as there are those who believe in the human capacity to regenerate itself. I was there and it was one of the most touching experiences of my life! The months of research and rehearsals, the huge amount of combined effort and creativity, and the enormous turn-out on the night, made this I think, an experience we in Barrydale/Smitsville can be truly humbled and very proud of. Lucky for me to know Derek Joubert and to be present for the event described above. Lucky for us all to have a teacher the stature of Derek working in Barrydale. I learned more that evening, and from this article than in a long lifetime concerned with these issues of South African history and present consciousness. For those of us who grew up with the SA Cultural History Museum at the top of Adderley Street, the new Slave Lodge is another wonderful new way of understanding the Cape. 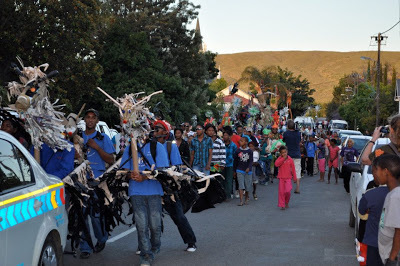 What luck for those who will be in Barrydale in December 2015. What an inspiration! You guys are amazing and the work you do is fantastic. Those puppets are incredible! 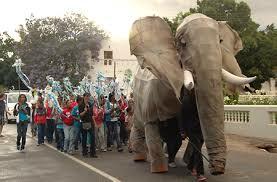 I can’t wait to see this year’s parade.